OLDEMIRO MARQUES BALÓI, Minister for Foreign Affairs and Cooperation of Mozambique, said the factors underlying present conflicts included the quest for self-determination, socio-political inclusion, natural resource use, wealth distribution, border disputes, and cultural and religious intolerance. Their resolution, therefore, should be based on dialogue underpinned by truth and responsibility; internal participation aimed at reaching a “real” solution and sustainable development; and the fight against poverty. The importance of those principles stemmed from his country’s experience. “Constant and interactive” dialogue within Mozambican society had allowed the country to consolidate national unity, peace and poverty eradication, and further develop its participatory democracy. The success of conflict management and resolution mechanisms required a re-evaluation of the mandates and conventional approaches to peacekeeping. It also required the cooperation of all stakeholders, at national, regional and international levels. Above all, conflict settlement was directly linked to understanding the nature of the conflict, and the integration of regional and subregional organizations. He noted with concern the persistent tension and instability in Africa, and highlighted the establishment of a mediation unit within the Defence and Security Organ of the Southern African Development Community (SADC). The Community’s mediation efforts to resolve the political deadlock in Madagascar and facilitate implementation of the Global Political Accord in Zimbabwe were making progress. The Southern African Development Community appealed for the full lifting of the economic sanctions imposed on Zimbabwe, in order to contribute to the country’s economic recovery and that of other countries in the region with which Zimbabwe maintained close economic ties. At the same time, SADC was concerned with the persistent instability and subsequent humanitarian crises in the Democratic Republic of the Congo. 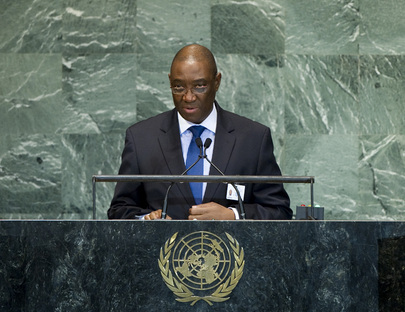 Regarding Guinea-Bissau, Mozambique was committed to the search for a viable solution aimed at restoring constitutional order. He was confident that progress in Somalia, and Sudan and South Sudan would contribute to those countries’ durable peace and stability. Turning to the Middle East, he expressed concern at the lack of progress, asserting that the conflicts there challenged, not only the countries involved and the region, but also the international community. Thus, he appealed to all relevant actors to engage in constructive dialogue and reiterated his conviction of the importance of the United Nations’ continuous engagement towards swift resolution. He reaffirmed unequivocal support to the Palestinian cause, as well as to the two-State solution. He also reaffirmed support for the international community’s involvement in the search for a sustainable solution to the self-determination cause in Western Sahara. The delays in conducting the referendum agreed by all parties under United Nations auspices were baffling. Additionally, Mozambique followed with concern the unjust economic embargo against Cuba. The nature of all present challenges underscored the increasing relevance of multilateral mechanisms and the need for agenda reform of the United Nations system, including the Security Council and General Assembly. In that connection, he advocated an approach that included a global strategic plan of action and a detailed programme for addressing conflicts; resource mobilization for peacekeeping missions; negotiation and implementation of sustainable political solutions; and long-term engagement, if necessary. The Security Council must be more proactive in solving conflicts through full implementation of its resolutions. Settlement of conflicts, after all, was a key condition for the pursuit of the internationally agreed development objectives, including the Millennium Development Goals, particularly for Africa and least developed countries. Member States should act in a concerted manner in the search for a consensual and sustainable post-2015 development agenda. Success of the Rio+20 outcome depended on an integrated approach between the economic, social and environmental components, he added. ANIFAH AMAN, Minister for Foreign Affairs of Malaysia, said it was difficult to understand why those responsible for the release of the film, Innocence of Muslims, and the publication of offensive caricatures could resort to such actions, knowing those would provoke 2 billion Muslims. He could only ascribe that to “blatant malicious intent”. Peace-loving people and responsible Governments must work to prevent a “small minority of bigots to sow the seed of hatred between the Muslim world and the West”. He was equally saddened by the ensuing violence; one life lost was too many. All those involved were guilty of extremism and must be held accountable. Such actions could not be defended under the pretext of human rights, freedoms, and liberties. It was time to delve deeper into the heart of the problem, namely, the relationship between freedom of expression and social responsibility. The authors of the Declaration of Human Rights, he was certain, did not have denigration in mind when they cited the need to protect freedom of expression. “When we discriminate against gender, it is called sexism; when African Americans are criticized and vilified, it is called racism; when the same is done to the Jews, people call it anti-Semitism; but why is it when Muslims are stigmatized and defamed, it is defended as freedom of expression?” he asked. The principle of moderation should be ingrained in all societies, as that implied a high degree of tolerance, trust and mutual understanding, and emphasized dialogue as an important tool for resolving disputes. Moreover, it was important to practice moderation in light of the “rising tide of extremism”. The Global Movement of Moderates had gained the recognition and support of the Commonwealth, Non-Aligned Movement, and ASEAN. He said his country remained seriously concerned about the situation in Syria. Any next step should be contemplated with the interest of the Syrian people in mind. Ultimately, it was not about who was wrong or right, but about putting an end to the bloodshed and resolving the conflict, in a peaceful and inclusive manner. The situation in the Occupied Palestinian Territory was also bleak, as, for more than six decades, the people of Palestine saw their lands confiscated to make way for settlements, and they saw displacements and evictions, including of children. Elsewhere, the international community was quick to call for action for those living under oppression, but it was “unashamed in not taking strong and decisive actions for the long-deprived Palestinians”. Surely, the international community, especially the powerful and influential nations, could do more to bring Israel to the negotiating table. With the declaration that emerged from the High-level Meeting on the Rule of Law, it was time for the international community to pressure Israel to fulfil its international obligations. Why was Palestine punished for wanting to become a rightful member of the United Nations? he wondered. With 132 countries recognizing the State of Palestine, it was clear the issue was tied to another, bigger one, namely the veto power in the Security Council. That was just another of the host of reasons why the United Nations, especially the Security Council, should be reformed. There were so many instances where the Council had failed to take action when action was needed most. “Time and time again, [the Council] has become a victim of its own creation”. Its composition should also reflect current global realities. It was ironic that the very institution formed in 1945 to promote and defend democracy was, itself, undemocratic. Virtually every aspect of reform had been argued, and many proposals had been submitted, yet none had made headway. Indeed, “we are nowhere closer to actual reform than when we first started,” he asserted. He called on States to be “realistic” and find workable solutions to reform.